Some great tips and ideas in this post on how to complete the look of your room with modern and contemporary window dressings. Enjoy! The way you dress your windows can change the ambience of the whole room – a contemporary design might easily be knocked out of balance with a retro fabric pattern or old-fashioned net curtains. A number of other things also need to be taken into consideration, such as privacy, the amount of light that can come through the window, and your budget. Contemporary interior design focuses on minimalism and neutral colours, using natural materials and a clean, unfussy approach. Your window should be the same, so look out for styles and designs that don’t take up too much space, and add a harmonious aspect to your room, rather than a sharp contrast. From a purely technical standpoint, make sure you’ve got your windows measured up and have a plan in place before you start buying anything. While a window treatment that is too small will look obviously poorly-fitted, a dressing that is too large can be just as catastrophic; you want to avoid taking up wall room or overlapping onto other furniture and designs, so make sure you have your measurements exactly right! Roman blinds: A set of made-to-measure roman blinds add a textured but sophisticated look to a contemporary design. Folding in on themselves as they rise, they offer a soft framing effect to the top of windows when open, and a suitably minimalist look when closed, giving you the best of both worlds. If you use heavy fabrics – especially effective in a larger space – balance this with matching colours or fabrics throughout the room to bring the whole design together. 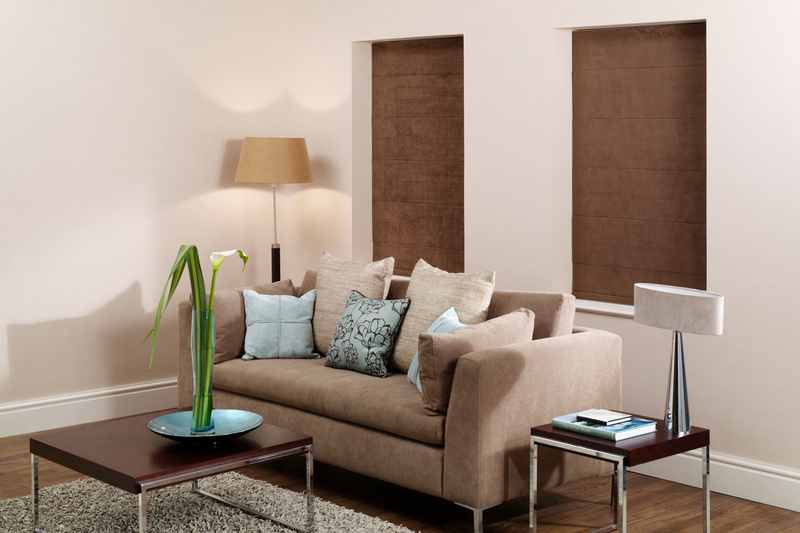 Any fabric-based blind will add to the natural look that a modern design benefits from, so bear this in mind while making your choice. Roller blinds: Roller blinds are ideal on smaller windows, especially in kitchens and bathrooms, as they offer an understated way of keeping windows covered without taking up wall space or ruining an existing aesthetic. Opaque designs are ideal for allowing light in without compromising on privacy, while specific blackout blinds are the perfect addition to a bedroom for practicality as well as style. Match them up with the colour scheme and hang alongside Venetian blinds in a larger room for more of a statement window. Materials: Neutral fabrics are definitely the way to go if you’re creating a light design with pale hues and soft textures; however, wooden blinds have become more and more popular recently, thanks to a rise in eco-friendly properties looking to reflect their energy savings in design as well as function. Venetian blinds or vertical hanging blinds contribute a distinctly linear appearance, which if desired can be softened with a pelmet. A Guest Post Collaboration with Direct Blinds.